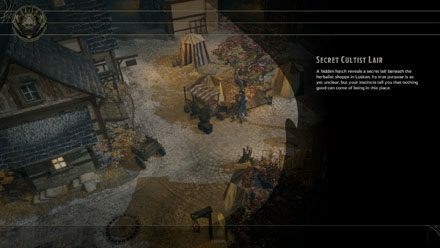 Secret Cultist Lair is a Location in Sword Coast Legends. A hidden hatch reveals a secret lair beneath the herbalist shoppe in Luskan. Its true purpose is as yet unclear, but your instincts tell you that nothing good can come of being in this place. This is a very small area. Defeat the Cultists and free Edwin from the ritual. Be careful. Cyrana is a difficult fight.